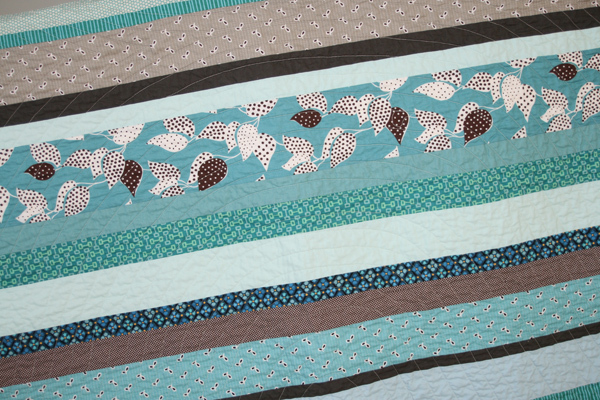 Ready for another strip quilt? How about another made of Flea Market Fancy, this time in blues and grays? The blues are some of my favorites, and I love seeing them all grouped together like this. On the back, I used Kona Ice Frappe, with a little yellow for contrast (and a bit of a pieced printed section, of course!). I thought about doing the whole backing in yellow, but didn’t have any on hand and didn’t have the patience to order and wait for it to arrive! This time I decided to play a bit with the quilting, using curved lines as a contrast to the straight lines of the strip design. I went for this arch design – a series of archs on one half of the quilt with a (sort of!) mirror image on the other half. To make the arch, I marked the centerpoint of the quilt and then using a water soluble marker, I drew out the first arch on either side freehand (which is why I say it’s sort of a mirror image!). After quilting the first arch, I used the edge guide attachment on my machine to quilt 1″ away from that arch until I filled in half the quilt. This was then repeated for the other half of the quilt. I love the design that’s created, especially on the backside of the quilt. And even though it took a while, it was fun to try out something a bit different! I thought about hanging on to this one, but since we all know the baby doesn’t need another quilt, into the shop it goes! sold, thanks Emily! 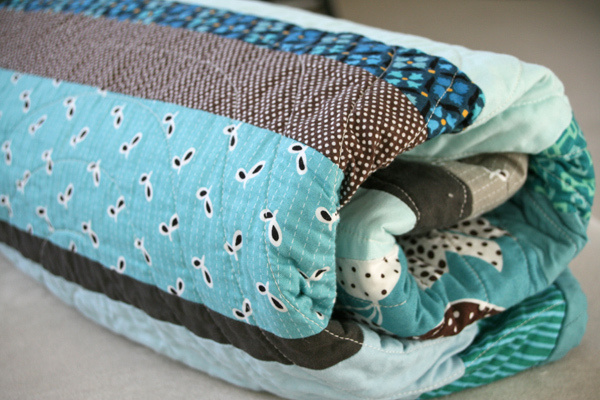 In case you missed it, you can find my mini tutorial on putting together a strip quilt here. This entry was posted in [search] Strip Quilts, Posts about Quilts, Quilts and tagged baby quilt, denyse schmidt, flea market fancy, handmade, quilt, quilting, strip quilt. Bookmark the permalink. I think I love this one best, and that’s saying something! The colors are so cool and calming and pretty. Great job, as usual! Love how it turned out-the colors are great…now I want to make a strip quilt today…it’s rainy and grey here today…perfect weather for sewing! Your work is beautiful – wish I came across your site while I was still living in VT. Thanks for some great inspiration! The quilting really makes the quilt! 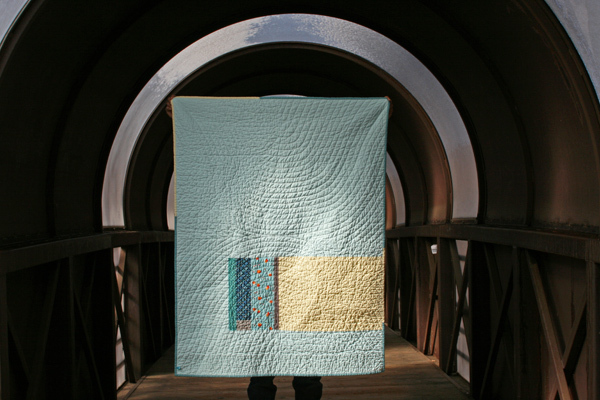 I love how your photo shoot location echos your quilting design. Beautiful quilt as usual! 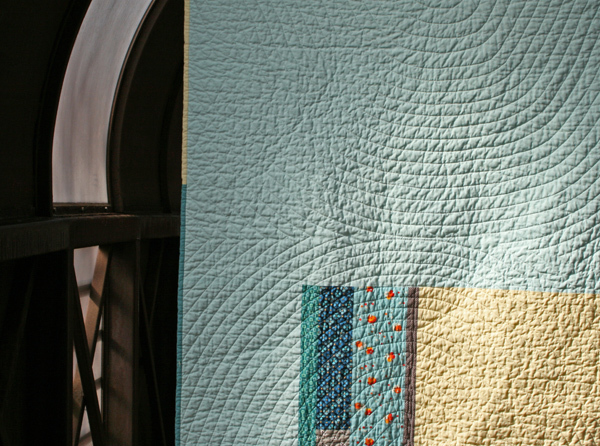 I love the curved lines of the quilting, really great touch. That top photo is awesome! What a great location to shoot quilts! i don’t know how you can possibly part with this one. maybe one day i’ll have such strength. the quilting is fab. more reason to get one of those edge guides…thank you. Never mind the quilt, I’m loving the “circle location” with the circle quilting!!!!! Such a pretty quilt! Awesome photos in the tunnel. 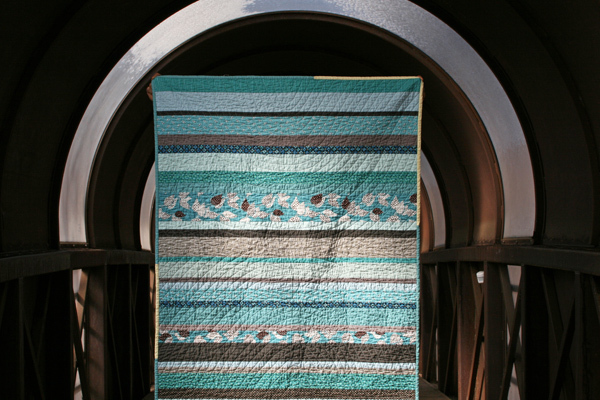 I love the contrast of the straight fabric lines to the curve of the tunnel but then I see the curves in the quilting. Awesome! wow this quilt is defiantly one of my favourites of yours. The first picture is amazing!! I might have to try that curved quilting, it turned out so nice! Fabulous quilt and a great backdrop for the photo! Beautiful!! I LOVE your quilting too!! The circles just set off the strips perfectly. This is so pretty, love the hints of yellow! Love, Love, Love the quilting! I just love the arched quilting. It totally makes the quilt IMO. Man, you have me wanting to do a strip quilt SO BAD. It doesn’t even look scary, is the thing. Lovely quilt. This makes me want to make something in blues! The photos really do it justice, where were they taken? Love the circle quilting. Lots of stitching! Love the backdrop in the photo too. What marker do you like for marking your quilt? I haven’t found anything that I have liked so far. This one is my favorite (so far)!!! LOVE the quilting too. I love your quilt, but your top photo of it would knock my socks off if I wasn’t barefoot! I think that may be one of my most favorite photographed quilt photos ever. What a great backdrop for the quilt. Fabulous photos. so cute, i love those shades and the quilting job is amazing! All your quilts are beautiful but this one seems extra special. Your choice of fabric is amazing and kudos on the quilting. Great job. Whoa, great quilting job! Your lines are so evenly spaced, looks fabulous! Do you use a walking foot? Your quilt is lovely….the quilting really makes it. And the backdrop….wow! I especially like the first picture. 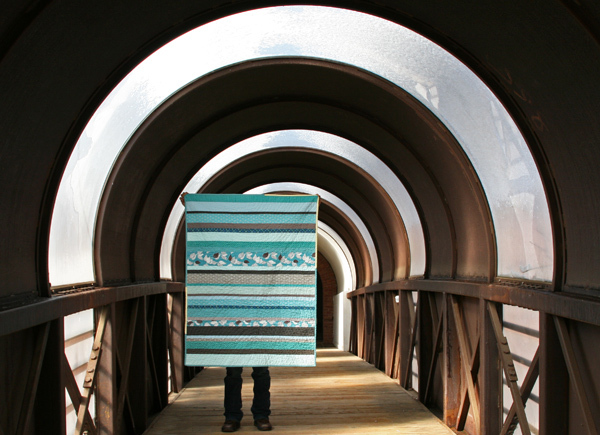 One of my favorite things is finding an awesome unusual place to photograph my quilts. My fav colours, great job. Please tell me what fabric you used for the little piece on the back that has the orange in it. Really beautiful. And your supply of flea market fancy is seemingly never-ending! I’m sure you posted sometime way back before I started reading/sewing about some sort of FMF haul you made before the great FMF depression. I’ll go looking for that post so I can have even more FMF envy. Wish I could afford this one. Absolutely LOVE the way you quilted it! And the quilt against that backdrop is awesome! Lovely!!! How courageous of you to use the FMF fabric! I can hardly cut into mine!! But, that said, you did a great job, shows off the prints nicely and love the color combo. Great quilting, too. i really like this one!! the backdrop really does make it pop!! Since you used your edge guide, I’m assuming you used your walking foot? Great great quilt! I love how you found the perfect place to photograph it to echo the circle quilting. And now a request for a circle quilting tutorial. How did you mark it, etc? PLEASE?? Okay, dork that I am. . .I reread the post and now get it. Wow, the quilting is awesome. Thanks so much for sharing how you did it! I’m always looking for good non-free-motion ideas. What an amazing photo! Perfect location to highlight your arch quilting. Beautiful! All the best for the upcoming birth. Hi Ashley—I am the one who bought the quilt. 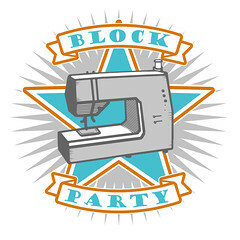 I met you this summer briefly when you came to the friday night dinner of Heather Ross’ weekend sewing. I was so impressed with your work. I love the quilt! It is even nicer in person. Thanks so much…and good luck with the next few weeks! 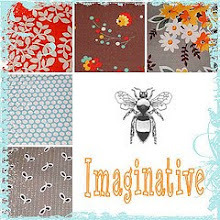 really nice job, love the color choices and patterns….